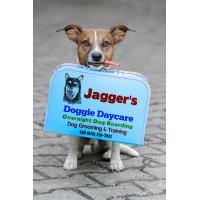 Jagger’s Doggie Daycare, LLC was born out of a need that was seen first-hand by the owners, Connie & Randy Olson. Many couples work away from their home and leave their dog(s) home alone to fend for themselves. This often results in various levels of “separation anxiety” for the pet. Other dogs suffer from "boredom" when left alone and they misbehave based on those emotions. Another concern is lack of exercise, which can add to the probability of dogs developing health issues sooner in life. While some dogs tolerate the separation okay, others struggle with the lack of companionship and they begin to experience behavioral problems that causes them to do things or eat things that can harm them. That is how we lost Jagger. He had a terrible case of separation anxiety. He could not be crated because he would hurt himself trying to get out. Because we let him have the run of the house, he would often find things to shred or destroy in an attempt to deal with his anxiety. It wasn't because he was mad at us, it was because he loved us and wanted to always be with us. The separation anxiety took it's toll on him. Spending just a few days a week at Jagger’s Doggie Daycare LLC can improve the health, happiness, and attitude of your fur baby. After a day at play with other dogs their size, they behave much better and they experience less stress in their life. They will come home exhausted (in a good way) ready to relax and be lovable with you. Just like kids, your dog will eagerly look forward to attending Jagger's Doggie Daycare LLC and will likely recognize where they are the moment you pull into the parking lot. 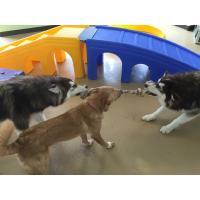 Dogs are natural pack animals and they want to be around other dogs. Leaving a dog home alone deprives the dog of the exercise they require and the socialization skills they need to be the best pet they can be. Rest assured, we will treat your dog like our own. Ask about our Stress-Free Dog Grooming Services, Obedience Training Classes, Overnight Dog Boarding, and the Self-Serve Dog Wash. Doggie Daycare’s are endorsed by many veterinarians and the ASPCA (American Society for the Prevention of Cruelty to Animals). We have affordable packages for Daycare which enable you to carry over your days from one month, to the next. Ask us about special package discounts for multiple dogs owned by the same person. We love dogs and have owned many breeds through the years, both large and small. We look forward to meeting your fur baby and welcoming them to the pack. "C'mon and Play."